an illusion that modern times have exposed. 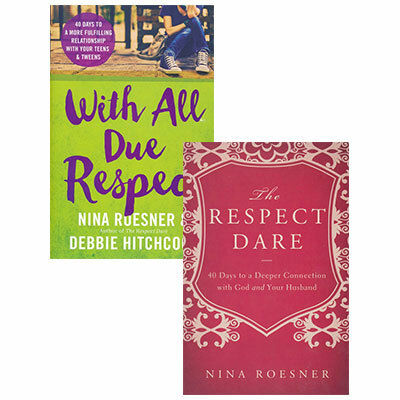 Nina Roesner has led countless women through this practical and life-changing journey, and in The Respect Dare she offers you the hope that so many others have found. Day by day, true stories and thought-provoking questions will help you apply biblical wisdom to the most important relationship in your life. With All Due Respect is a handbook for parents navigating the difficulties of the tween and teen years. Roesner and Hitchcock help parents identify what successful relationships look like and give easy-to-follow lessons in enforcing rules, communicating lovingly, resetting relationships, overcoming fears and exhaustion, and handling rebellion. Each day features a story every mom can relate to, down-to-earth questions to think about, and a prayer to launch an action plan. As a result, the reader gains new skills and perspective, greater strength, and an ability to live out faith daily as never before. With All Due Respect is for all parents seeking not only to connect more deeply with and positively impact their teens and tweens, but also to grow more deeply in faith through the process.